Every dreamed of your own bottle of Chateau Gary? How about a bottle of Bruce Heritage or Sharon Shiraz? Visit Penfolds historic Barossa Valley winery and discover the heart of Australia's greatest wine country while indulging in the ultimate tasting - Penfold's legendary Grange. But if tasting is not enough for you, why not make your own wine, creating a unique memory or gift, from taste to label. While the cellar dollar is usually open to the public, you need to book through Adelaide Tours to participate in this extra special experience. Advanced bookings are required. 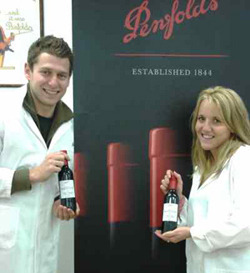 The Penfold's wine educators will explain how to blend and create your own wine. Then it's up to you. Your wine will consist of components from the Grenache, Shiraz and Mourvedre vineyards, blended to your tastes. So, don a white coat and get your nose and taste buds ready.